DALLAS - The May Executive Board meeting closed Tuesday with success stories shared by a number of Texas Baptists staff. 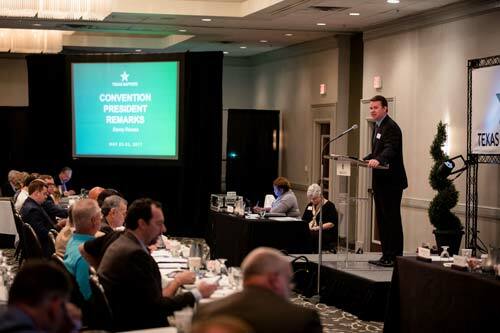 The flurry of two-minute reports covered recent events, new ministry initiatives and professions of faith, making clear to board members that God is moving in and through the Convention and its churches. Change Maker conference powered by Congreso, held in April, led to 206 salvations, 156 re-dedications and 49 students who surrendered to full-time ministry. More than 13,000 people heard the Gospel through the Singing Men of Texas mission trip to Ukraine in April. Two hundred thirty students were commissioned to serve on summer mission trips through Go Now Missions on Sunday, May 23. New Church Planting Centers are being formed around the state to train and equip future church planters. The first annual Hispanic Pastors/Wives Retreat was held May 5-6 with 150 couples receiving intentional encouragement and support. On Monday evening, Tom Howe, pastor of Birdville Baptist Church, and Kris Dress, pastor of Haltom Road Baptist Church, presented a check in the amount of $29,245.33 to the Texas Baptist Hunger Offering. The two churches joined together in fundraising over two months to provide the gift to Hunger Offering partner Lott Carey Mission to build a water tower in Brewerville, Liberia. 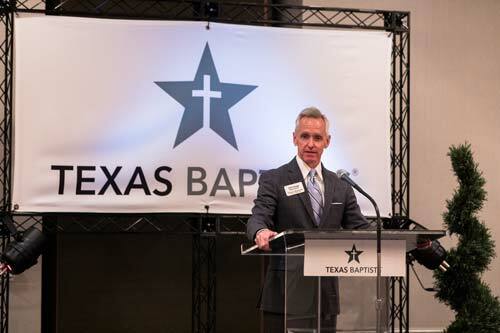 Executive Director David Hardage highlighted several Texas Baptists ministries including the new Missionary Adoption Program, a partnership with the Brazilian Baptist Convention. On a recent trip to Brazil, Hardage was able to meet with several missionaries who are supported through the program and reported to the board that he witnessed MAP working first-hand. Currently, 16 churches have adopted missionaries to indigenous people groups along the Amazon with 32 missionaries available for adoption. Hardage also highlighted Church Safety Workshops recently held around the state, with more trainings led by MinistrySafe to be held in the fall. He also spoke to the caliber of speakers, workshops and worship attendees can expect at the much anticipated Annual Meeting to be held November 12-14 in Waco. During Tuesday’s business session, Jill Larsen, treasurer and CFO, shared the treasurer’s report, noting Texas Baptists are at 99.3 percent of Cooperative Program budget giving for 2017 at $8.2 million. Investments stand at $130.9 million, reflecting a $6 million increase primarily due to increases in market value and a new endowment gift. Gerald Caldwell, chair of the Finance Committee, brought a recommendation for the appropriation of up to $100,000 of additional funds to complete the demolition project of the Baptist University of the Americas buildings. The board approved the appointment of five new executive board members to fill vacancies, including Lance Wood, First Baptist Church, Clarendon; Dale Pond, Green Acres Baptist Church, Tyler; Kevin Woolley, Mt. Sylvan Baptist Church, Tyler; Lee Laine Terry Willis, Willow Meadows Baptist Church, Houston; and Daniel Ho, Chinese Baptist Church of Houston. Additionally, the board approved the move of two Howard Payne University trustees currently serving in board-elected positions into BGCT-elected positions. In his address to the executive board, President Danny Reeves shared that believers need to show compassion when chaos ensues around the world. Additionally, the second cohort of Leadership Texas Baptists was honored during Monday evening’s session. 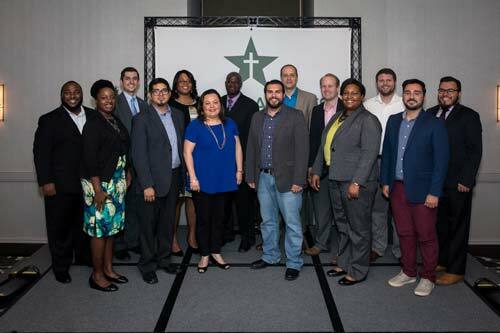 Fourteen emerging young leaders participated in the nine-month program where they were introduced to leaders of Texas Baptists institutions, convention staff and ministry leaders around the state. Staff members Robbie Francovich, cross cultural specialist at the University of Texas at Austin Baptist Student Ministry, and Bobby Smith, director of Chaplaincy Relations, were each recognized for 20 years of service to Texas Baptists.